Graham Arader: Offering of the Day: Mr. Greenvil Collins Master Of His Ship the Speedwell, His Journal of the Voyage of the Said Shipp Sent, and Lost, Upon the Discovery of a North-East Passage Anno 1676. Capt. Jon Wood. (v.p.,May-August 1676). COLLINS, Captain Greenville. Offering of the Day: Mr. Greenvil Collins Master Of His Ship the Speedwell, His Journal of the Voyage of the Said Shipp Sent, and Lost, Upon the Discovery of a North-East Passage Anno 1676. Capt. Jon Wood. (v.p.,May-August 1676). COLLINS, Captain Greenville. In 1493 to defuse trade disputes Pope Alexander VI split the discovered world in two between Spain and Portugal, leaving France, the Netherlands and England without a sea route to the trading nations of Asia. The desire to establish such a route motivated much of the European exploration of both coasts of North America. When it became apparent that there was no route through the heart of the continent, attention turned to the possibility of a passage through northern waters. It was not until 1906 that passage from Greenland to Alaska was successfully navigated. At the command of King Charles II, the expedition set out from Deptford 6 May 1676. It consisted of two ships, the Speedwell, commanded by Captain John Wood with Greenville Collins as its master, and the Prosperous, commanded by Captain William Flawes. As shown by Collins's map, they sailed north toward Greenland, and then east along the ice north of Russia, through the Barents Sea. On 29 June, the Speedwell ran aground and was wrecked during a storm. The crew got safely ashore, but the ship had become separated from the Prosperous in a heavy fog. They were not rescued by the Prosperous until 8 July. Collins's log records the voyage of the Speedwell in great detail, with daily entries giving the location of the ship, wind, and weather conditions, and observations on their surroundings, including the natives, animals, and topography of the Shetland Islands. He provides a detailed map, complete with depth sounds of the passage, and directions for sailing into Brace Sound. He describes magnificent icebergs and ice formations, noting that some were the color blue, as high as the towers of Westminster Abbey, and others shaped like triumphal arches. He mentions the numerous "sea horses" they saw and attempted to kill, and includes a sketch of a female walrus and her calf. Whales were also sighted. Once the Speedwell had run aground, the crew was able to salvage their provisions and weapons, and set up a camp called "Mount Missery," of which Collins drew a double-page topographical view, until the Prosperous came to their rescue. Greenville Collins is best known as a hydrographer in the Royal Navy and the author of Great Britain's Coasting Pilot (1693). The three maps that he drew within his log attest to his talent and ability. The first single-page colored map shows the polar regions on a circular projection stretching from the Button, Hudson, and Baffin Bays in the west around the Arctic Circle to the presumed northern coastline of Russia to 185º east of Greenwich. The other single-page colored map is a detailed chart showing the routes of the Speedwell and Prosperous through the arctic seas north of Lapland to Nova Zembla. 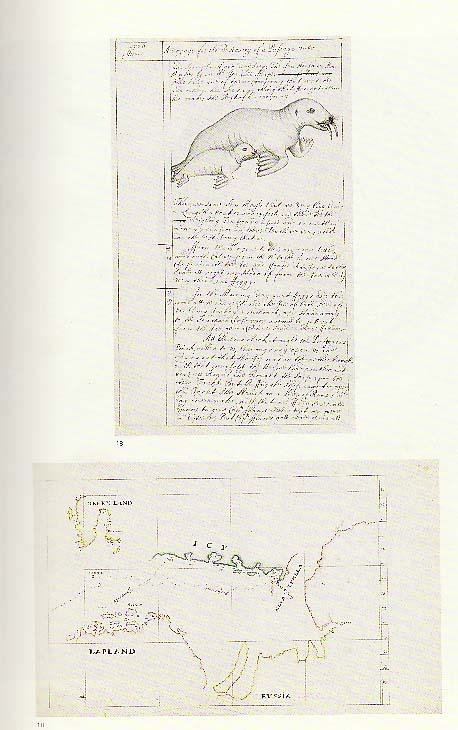 The in-text map shows part of the Shetland Islands and Brace Sound, with a cartouche and scale. Thirty-six manuscript charts by Collins are known to survive, all but ten of them in the Admiralty Hydrographic Department in Taunton. Only two other logs by Collins survive. One, dated later in 1676, records his service with the galley frigate Charles, and the other covers the period 1688-89, when Collins was surveying the British coastline. As Captain Wood had lost his journal and notes, Samuel Pepys, a secretary of the Commission, ordered him to use the account submitted by Collins. On 4 September 1676, Pepys recorded that "he had this morning received His Majesty's orders in favour of Mr. Collins from whom and this journal.